We are in the business of educating and developing leaders in multinational organizations for more than 25 years. During this time, we have found that a significant component of failure is the challenge for leaders (and leadership developers) to close the ‘knowing vs. doing’ gap. As much as leaders have best intentions to apply what they learn to their respective role, they are often better in their knowledge of what to do than in their actual actions. This understanding has led us to focus our efforts on a new philosophy and approach to leadership development: Awareness-based Leadership (AL). The essence of Awareness-based leadership is making a profound shift to the inner place from which a leader/leadership team operates. It’s about leaving our habitual, limiting patterns of action and thought behind while leaning into an emerging future, the most important leadership capability today. 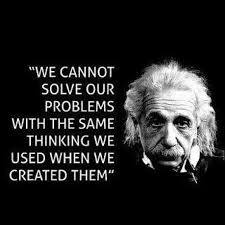 AL requires learning to attend to what needs to be attended to now, what is in front of us as a possibility. Leading in this way is like Michelangelo’s capability to see the figure of David in the untouched marble block. To develop the capability of awareness, we have to adapt or abandon altogether our dominant mode of ‘downloading the past’ which serves only to reproduce the restrictive patterns of our thinking. This is why leaders often feel like they are walking in circles. Einstein was right when he stated, ‘The mind that has created the problem in the first place cannot be part of its solution.’ There needs to be an inner quantum leap in awareness. In working with leaders today, we seek to show them how to embrace three key leadership practices (figure 1). The first and most essential component of changing one’s leadership style begins with developing Self-Awareness. This takes an ability to reflect on yourself with intellectual rigor to find the truth of your being and sufficient emotional courage to deal with the natural resistance and fear to acknowledge what you find. Self-awareness is the interface between both professional development and personal growth, as neither can exist without the other. They are the prerequisite, the conditio sine qua non, for business and personal transformation. This Self-Awareness can be learned, and it is genuinely liberating. 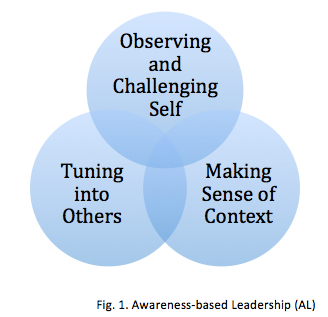 This component of AL refers to the ability to turn the lens of our Awareness onto others. This skill is a component of emotional intelligence. When tuning into others, we demonstrate empathy, i.e., being sensitive to what, how and why people feel and think the way they do. Aware leaders are able to accept others and use their talents for the good of the collective, not just the Self. They seek to establish and maintain mutually satisfying relationships that are rewarding, enjoyable and characterized by give and take. They demonstrate their ability for authentic communication, which is not always easy, but is the basis for successful relationships based on trust. This skill is invaluable for leaders, as their work requires them to interface effectively with many people. The third component of AL is sense-making. There’s an apt analogy by Brian Arthur that characterizes the challenge of sense-making in today’s world. Imagine you are milling about in a large casino with the top leaders of high tech. Over at one table, a game is starting called Multimedia; over at another table is a game called Web Services. There are many such tables and you choose one to sit at. ‘How much to play?’ you ask. ‘Three billion’, the croupier replies. ‘Who’ll be playing?’ you ask. “We don’t know until they show up,’ he replies. ‘These will emerge as the game unfolds,’ says the croupier. ‘What are the odds of winning?’ you wonder. At SyNet, we are deeply committed to the practice and principles of Awareness-based leadership. This is how we organize and run our own organization, how we relate to our clients, to the teams of consultants and administrators we work with and last not least how we relate amongst ourselves. Within SyNet is our testing ground; this is where we refine what we bring to our clients—authentic and transformational Awareness-based Leadership training, experienced directly and personally by every one of our team members. This is how we know what we teach works. We are what we teach!